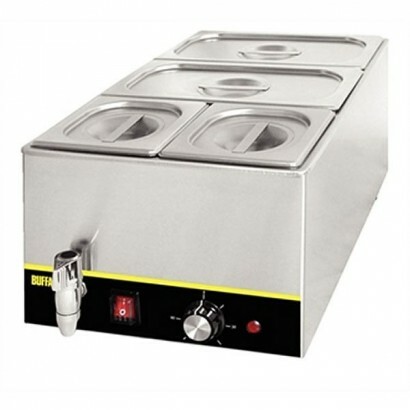 The commercial bains marie is an essential piece of kit for any operation that wants to hold cooked foods at a constant temperature, ready for service. 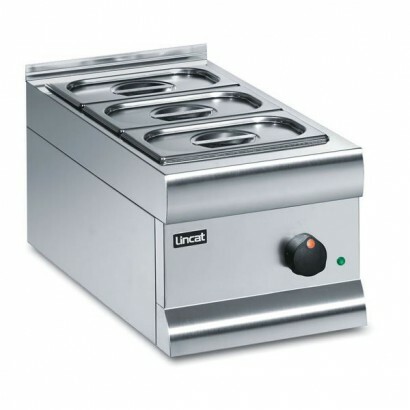 Available in a range of sizes, from the single round pot Lincat LB1 ideal for the service of soup or single service sauces up to the large-scale Counterline Integrale 6 pan heated bain marie, designed specifically to fit into your own bespoke counter design. Whether it’s a round pot or gastronorm pan design, with wet or dry heat there is a huge range to choose from, from well-known and trusted commercial brands such as Burco, Lincat, Buffalo and Counterline. 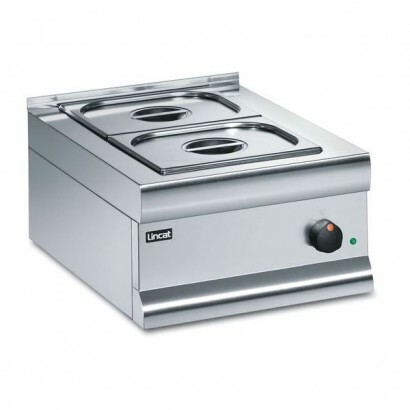 Along with counter top designed Corr Chilled also have a range of bain marie units mounted on hot or ambient cupboards for easy food and crockery service at the point of service. Choose from the popular Lincat Panther series such as the Lincat P6B4 with hot cupboard, ideal for large volume mobile service with its four sturdy fitted castors. For help or advice on any of the products in this range please contact our friendly sales team on 0161 442 9174. 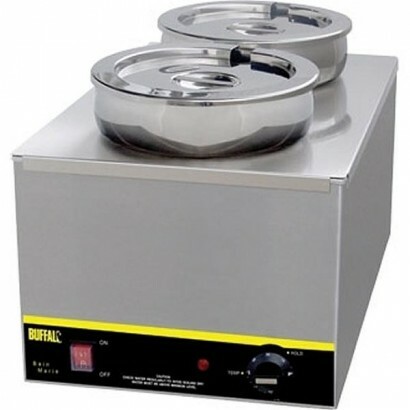 A bain marie is basically a double boiler that, traditionally, is wide, cylindrical and comprising a handle and two containers. Some models also have a base beneath the outer container. Inside that container is the other, smaller one. The working fluid - usually water - is kept in the outer container, while the smaller container will hold material that is to be cooked or heated. 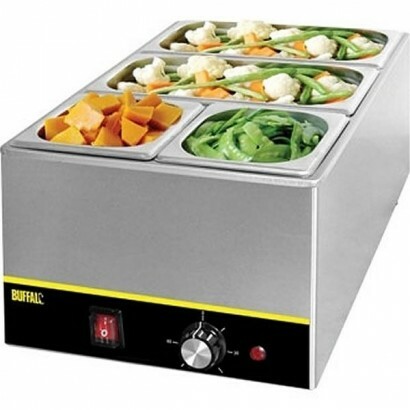 Heating is possible due to a heat source that is under the lower container or part of the bain marie's base. 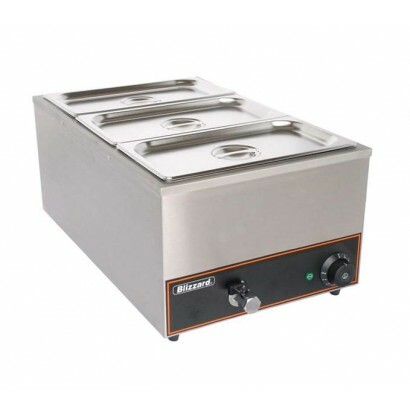 When the bain marie is being used, the temperature of both containers' materials will increase as desired. The working fluid, roughly halfway into which the upper container will be immersed, can insulate to help prevent the inner vessel's contents scorching or boiling. What could you use a bain marie for? There is a range of culinary applications to which you can put a bain marie. It could, for instance, be used to melt chocolate, bake a cheesecake in such a way that its top's centre does not crack, cook custard, heat classic warm sauces without curdling them, or thicken condensed milk. 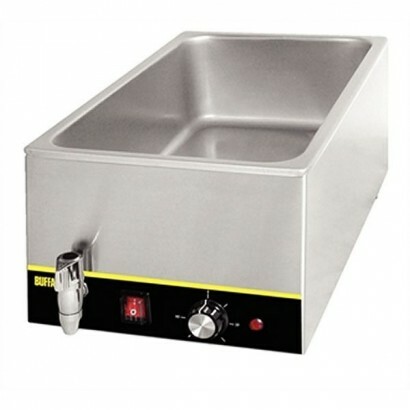 The name 'bain marie' derives from balneum Mariae, a medieval-Latin term literally meaning "Mary's bath". An ancient alchemist called Mary the Jewess has often been cited as responsible for inventing the bain marie device, though it is known that, many centuries before her time, Theophrastus and Hippocrates were aware of the water bath. Lincat LRB dry heat bains marie with round pots available in one, two and three pot sizes with stain.. 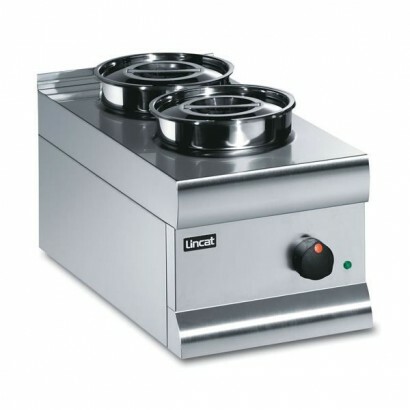 The Buffalo L371 Bains Marie is a high quality stainless steel bains marie unit without pans perfect..
Lincat LBM dry heat bains marie available in two, four and six pan sizes available. 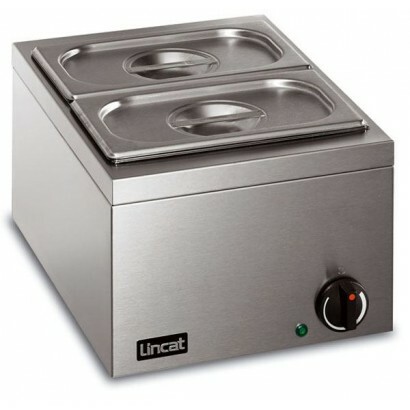 Perfect for sauc..
Lincat LRBW wet heat bains marie with large round pots. 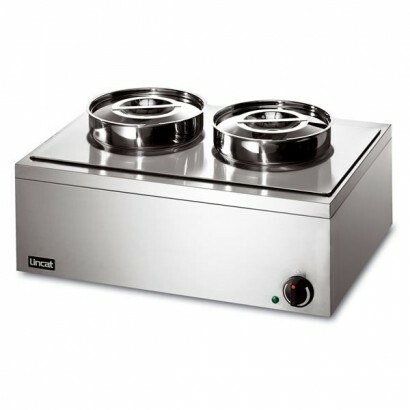 Available in three sizes, one, two and three..
Lincat LBMW wet heat bains marie in three sizes, two, four and six pan capacity. The unit can be use.. This high quality great value stainless steel bains marie from Buffalo has a fitted tap for easy dra.. 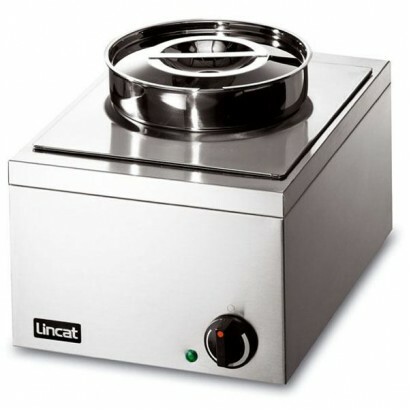 The Lincat LRB dry heat bains marie with round pots unit is available in one, two and three pot size.. 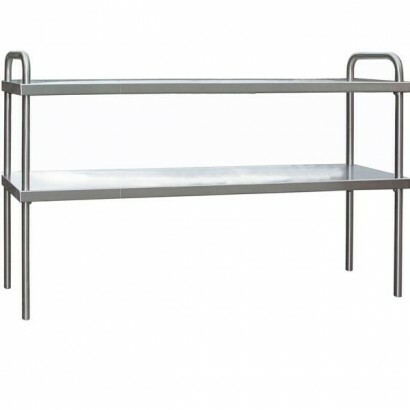 Product Information External Dimensions: H 235 x W 350 x D 580mm Standard Delivery: 3-5 Work.. The Buffalo S007 Bain Marie is a durable stainless steel bains marie which comes complete with pans ..
Lincat BM3 electric bains marie available in wet or dry heat options. Supplied as a base unit or wit..
Lincat counter top bains marie. 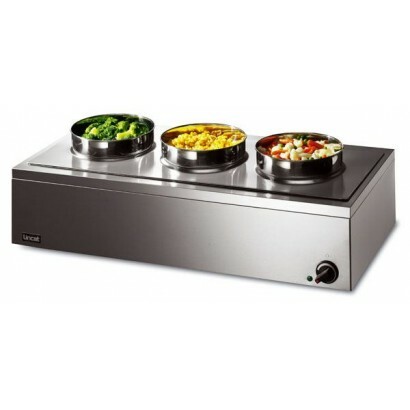 A 2 pot bains unit available in wet or dry heat with stainless steel.. 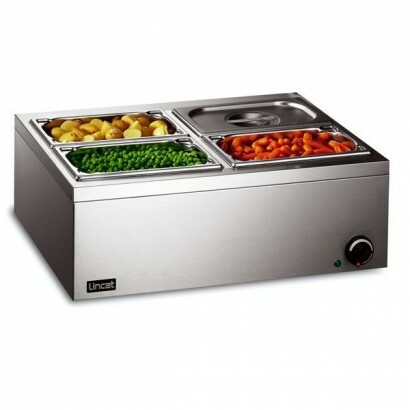 This top quality bain marie is fitted with a tap for easy drainage and gastronorm pans for easy set .. The Lincat LRBW wet heat bains marie with large round pots is available in three sizes, one, two and..
Lincat BM4 bains marie. Electric bains marie available in wet or dry heat options. 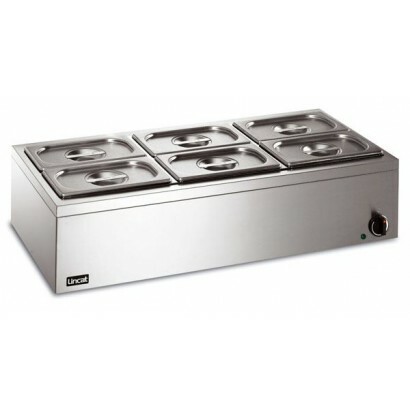 Supplied as a bas..
For a great value round pot bain marie with two 5 litre pots ideal for soups, gravy or mushy peas yo..